As one of the first camps in the Selous Game Reserve, Siwandu takes prime position amongst the palm trees on the banks of Lake Nzerakera, one of the best locations for resident game in the area. As one of the first camps in the Selous Game Reserve, Siwandu takes prime position amongst the palm trees on the banks of Lake Nzerakera, one of the best locations for resident game in the area. Formerly known as Selous Safari Camp, this elegant and comfortable camp is the perfect residence to experience the breathtaking landscape and abundant wildlife of Selous Game Reserve. Siwandu’s location is considered one of the undisputed prime sites for exceptional game viewing in the Reserve, and offers a diverse range of activities to ensure guests take full advantage of having this rich African wilderness on their doorstep. Experienced guides, many of whom have spent all their years in the Siwandu area, personally tailor all activities to suit guests’ requirements. Game drives are the main activity of the day, allowing guests to explore deeper into the more remote areas of the Reserve accompanied by an expert driver guide in an open-sided safari vehicle, especially adapted for close-up viewing. Unusually for Tanzania, off-road driving is permitted in the Siwandu, making it much easier to track thrilling sightings. Game walks and safaris can be arranged to get up close to nature and learn about the smaller species, animal tracking and ecosystems. These are usually taken early in the morning before it gets too hot, accompanied by an armed walking guide and an armed askari/local guard. For the more adventurous, fly-camping under the stars with the experts is an extremely worthwhile experience and can be arranged. One of the highlights of a stay at Siwandu is to explore Lake Nzerakera and the waterways of the Rufiji River delta on a motorboat safari. Siwandu operates some of the best boating safaris in the area due to its location on the lake edge, and offers both sturdy metal boats with canopies as well as pontoon boats that allow guests the luxury of dining or sipping a sundowner while on the lake. As well as the obvious hippos and crocodiles, encounters with elephants along the banks are not unusual and the bird-watching is excellent. Guests can also pause for a spot of fishing if desired. Siwandu’s guest accommodation consists of thirteen luxury tents, raised on wooden platforms and divided into two camps – North and South. Each camp has its own lounge, well-stocked bar, dining area and kitchen, providing a very personal and intimate safari experience. Movement between camps isn’t necessary as each has its own host, guides, game vehicles, swimming pool and jetty for boat safaris. North camp consists of six tents and South camp has seven tents. One of the advantages of two smaller camps is that groups or families travelling together can book one camp exclusively for own use, adding that extra touch of seclusion and creating a more personal experience. Broadly set apart along the lakeshore, Siwandu’s superbly appointed accommodation at both camps ensures maximum privacy and, with verandas to the front and side, guests have ample opportunity to soak up the wilderness of the Selous. Each spacious, canvas tent has an octagonal shaped bedroom, huge bed and en-suite bathroom to the side with open-air shower and is topped in palm leaf thatch. Secure mosquito netting walls not only allow constant airflow but enable guests to watch the animals wander past on their way to the lake. 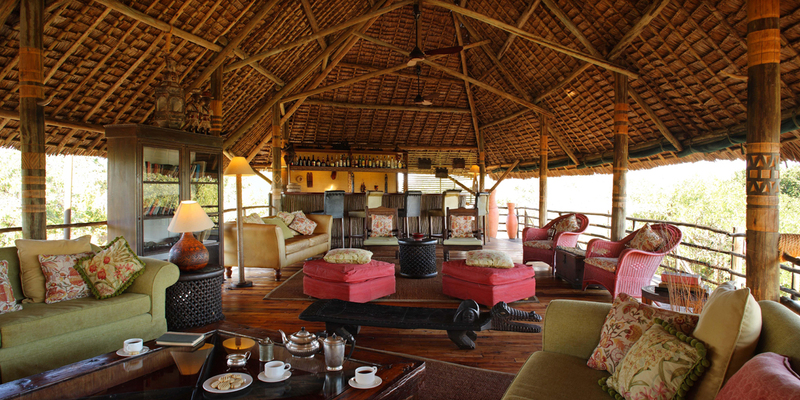 The lounge, bar and dining areas are also raised on platforms, providing an excellent relaxation zone with large, comfortable sofas and a wildlife reference library, all with uninterrupted views of the lake and animals sauntering through camp. Bush meals and sundowners are a particular feature at Siwandu, notably the bush breakfasts served at the end of a morning walk. Dinner is usually served in the dining tent, but can also be served on the tent verandas or at a surprise location for a more romantic, intimate experience.